The Henry Level Pro 40 lb. 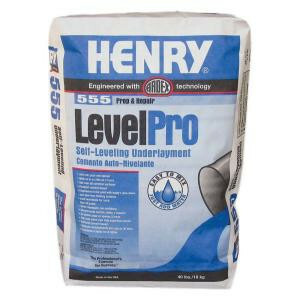 Self-Leveling Underlayment is an easy-to-use, cement-based underlayment that self levels. Just mix it with water, pour and spread. The underlayment is excellent for smoothing and flattening interior surfaces before installing floor coverings. Use over concrete, wood, tile, terrazzo and cut back adhesive.